Clear Frosted Shoppers with Loop Handles, 8" x 5" x 10" x 5"
Clear Frosted Shoppers with Loop Handles, 16" x 6" x 12" x 6"
Clear Frosted Shoppers with Loop Handles, 17" x 7" x 18" x 7"
Dimensions: 17" x 7" x 18" x 7"
Clear Frosted Shoppers with Loop Handles, 8" x 4" x 7" x 4"
Dimensions: 8" x 4" x 7" x 4"
Clear Frosted Shoppers with Loop Handles, 10" x 5" x 13" x 5"
Dimensions: 10" x 5" x 13" x 5"
Black Frosted Shoppers with Loop Handles, 8" x 5" x 10" x 5"
Hot Pink Frosted Shoppers with Loop Handles, 8" x 5" x 10" x 5"
Clear Frosted Shoppers with Loop Handles, 13" x 7" x 13" x 7"
Dimensions: 13" x 7" x 13" x 7"
Clear Frosted Shoppers with Loop Handles, 5" x 3" x 8" x 3"
Dimensions: 13" / 9" x 10" x 3"
Black Frosted Shoppers with Loop Handles, 16" x 6" x 12" x 6"
Black Frosted Shoppers with Loop Handles, 8" x 4" x 7" x 4"
Clear Frosted Shoppers with Loop Handles, 5" x 3" x 13" x 3"
Dimensions: 5" x 3" x 13" x 3"
Hot Pink Frosted Shoppers with Loop Handles, 16" x 6" x 12" x 6"
Espresso Frosted Shoppers with Loop Handles, 8" x 5" x 10" x 5"
Dimensions: 18" / 13" x 13.5" x 4.5"
Chamois Frosted Shoppers with Loop Handles, 8" x 5" x 10" x 5"
Evergreen Frosted Shoppers with Loop Handles, 8" x 5" x 10" x 5"
American Retail Supply has a wide variety of Plastic Shopping bags. You will love the way these plastic shopping bags look in your store. Use plastic shopping bags for apparel, gifts, cosmetics and more! The frosted shopping bags is one of the hottest packaging products for retail stores. These offer a luxurious way to package retail items and are something your customers can reuse. Stock Plastic Shopping Bags with soft flexi loop handles are made of 3.5 and 4 mil thick Hi Density plastic which gives them their frosted color and extra strength feel. Plastic Shopping Bags with Soft Loops Handles (Handle made of approximately 1 1/2" wide piece of plastic to form a loop handle) or Trifold (Handle made of 1 piece of plastic around 1 1/2" wide folded in thirds and sealed to form a loop handle). 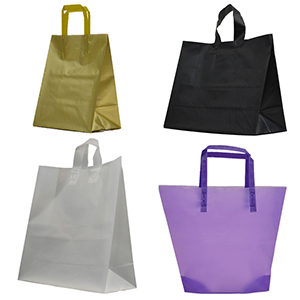 We also have plastic colored trapezoid shaped bags with clear tri-fold handles and gusseted bottom. Another exquisite plastic shopping bag is our Precious Metals with Tri Fold handle shoppers. Available in Gold or Silver. Packed 250 per case. Add more flare to your packaging with these Precious Metal Pattern Printed Tissues.